In its beginning, photography was considered truth, the documentation of historical events. But even in its earliest days the medium’s practitioners manipulated reality. Nineteenth-century French photographer Gustave Le Gray, for example, combined the clouds from one negative with the foreground of another to get the exposure just right. Along came Jerry Uelsmann in the 1950s, experimenting with multiple enlargers and advanced masking, diffusing, burning and dodging techniques, to create imaginary images in the darkroom decades before the advent of Photoshop. Uelsmann’s work references Surrealists Rene Magritte, Max Ernst and Man Ray. Uelsmann continues to practice traditional darkroom techniques while his wife, Maggie Taylor, employs Photoshop to create a surreal world. “Maggie and I have to invent our realities,” Uelsmann says. 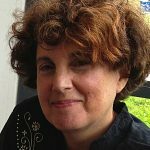 Martha Weintraub, a protégé of Taylor and Uelsmann, also invents her own realities. 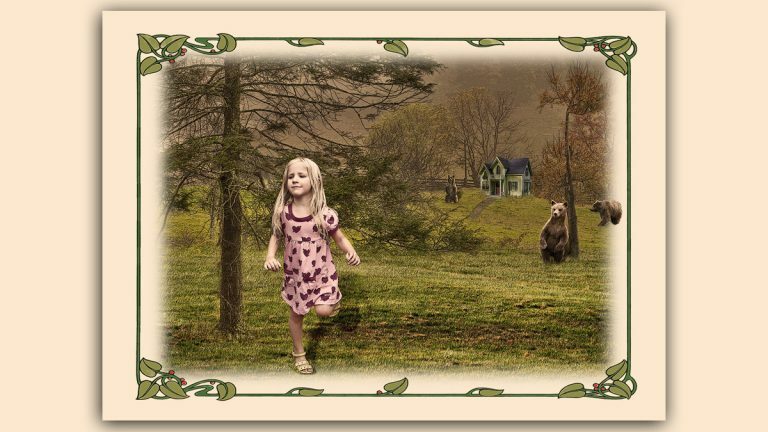 She will be exhibiting her fantastical photographs in Story Hour at the Gallery at Chapin School through Jan. 30,. As a former writer and editor of children’s textbooks, Weintraub explores her love of children’s literature in this exhibit. Some of the images she has created evoke classic children’s tales. She uses her granddaughters Natalie, 6, and Miranda, 3, as models – and that’s where reality ends. In “Tea Party,” for example, we see a blonde girl in a wing chair – presumably Alice – seated at a table, set with a blue-and-white tea set, with another blonde girl in Mad Hatter millinery; sandwiched between them is a rabbit in a flannel shirt. The woody landscape behind them, with its arching branches, was shot at Grounds For Sculpture. Also from Alice in Wonderland is a scene of the young heroine talking to a hookah-smoking caterpillar on top of a mushroom. Yet another shows a blonde girl in a dress covered with hearts chasing a rabbit down a hole. There’s Rapunzel – a little girl looks down from the top window of a stone tower, her blond tresses flowing to a lower parapet; Little Boy Blue (he sits alongside a haystack with his brass horn with sheep in the meadow and cow in the corn); and Little Red Riding Hood. What makes Weintraub’s work believable are the shadows she adds to the objects and figures she layers into a scene, so it doesn’t look pasted together. “It took a long time to learn and lots of experimentation,” she says. All of the images are surrounded by a frame of a scrolling line, suggestive of Victorian children’s book illustrations. Following in her mother’s footsteps Weintraub, 72, took up riding a recumbent tricycle at 70 and completed 67 miles in a day at a competitive event in Salisbury, Maryland. It was the boost Weintraub needed. Taylor taught her some techniques that day, and Weintraub signed up for her workshop. It all began with a love of children’s books, and now Weintraub is creating her own.